If you are looking for a natural spring in the Central Texas area to visit with the entire family, than Krause Springs is it. Here are 10 Tips for Krause Springs. 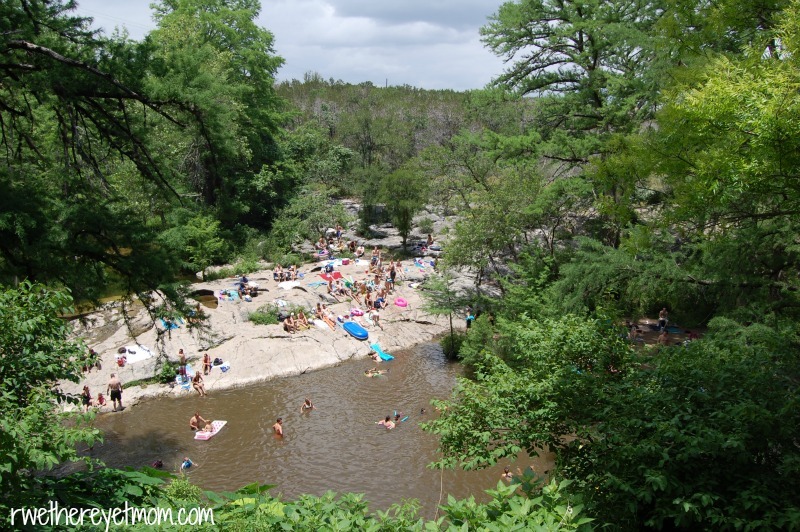 Krause Springs is a GORGEOUS & hidden oasis in the Austin area. With over 32 natural springs on the property that feed both the manmade and natural pools, it is welcome treat on a hot summer day. I put off visiting Krause Springs for a few years and wish I hadn’t. It is relaxing and fun for the whole family. So, if you have been waiting to go, don’t. Go this summer and use the following tips to make it a fun trip for your family. When you first arrive, take a moment to walk through these beautiful gardens, listen to the giant wind chimes, and soak in the serene atmosphere. My children really enjoyed seeing all the flowers, water features, and even caught a glimpse of a snake. I know you are here for the springs, but these gardens are beautiful. This pool is fed with the natural spring water and is just as cool & refreshing as the natural one. It’s perfect for anyone who might be squeamish about swimming in the natural pool waters. We went down to the waterfall and grotto when we first arrived and then swam at this pool later in the afternoon. What we found is that it became more and more crowded as the day went on. There are also great picnic areas all around here. We visited in May, so we wanted a spot on the rock to warm in the sun. There are lots of shaded areas to choose from as well. The staircase down to the pool is a bit slippery as the rocks around the pool are too. Make sure your shoes have a grip on the bottom. My flip-flops did not and I was slipping everywhere I stepped. Once I was down to the big rock, I ended up taking them off. And we learned later, there is another staircase to use that is a bit easier to go up & down – keep waking away from the manmade pool, past this one, and you will see it. The water is COLD. Don’t tiptoe your way into it, just get right in. After warming yourself in the sun on the rock, the water feels amazing!! When we visited, it had rained hard a few days before, so the water was pretty murky. The owner told me that the more people visiting, the less clear the water is form all the silt being stirred up. He did say on a weekday, this water can be crystal-clear blue. That was enough motivation to take a trip back! I have a 4 year old and I waited until my husband and friends could go with us to go. If you have little ones, it just makes sense to have more adult eyes and hands to help hold with you. There are no lifeguards at Krause Springs, so swim at your own risk (there are waivers to sign when you enter). The bottom is rocky, so wading, sitting in a tube and definitely no diving are in order. The area with the rope swing is deep. We took a short hike into the woods (there are trails) and found another gorgeous waterfall. The friends we were with had recently visited Hawaii and commented that it was just as pretty – not at all what you would expect to see in Central Texas. I didn’t have my camera with me, so you are just going to have to make a trip out there to see it in person! Feel free to bring your own food. There are grills to cook out on as well. We saw many families have a great big spread – their watermelon looked amazing. No glass containers allowed. You can also pick up BBQ from Opie’s BBQ in Spicewood to take out with you. We opted for the snowcones they offer at a stand on site. The perfect summer treat! If you are looking to go when it is less crowded, the owner said that weekdays are best. Now with school out, that may not be the case. However, we were there on Memorial Day and it didn’t seem that bad. It was crowded, but it wasn’t like we couldn’t find a place to sit or the water was too packed. I say go anytime – the springs are worth it! I can’t read your blog too much. Our closest friends just moved to the Austin area last year and they want us to go there, too. The variety of things to do, and the fun it seems like every one has pulls my heart in different directions.